Fastest 10k of 2013, so far. 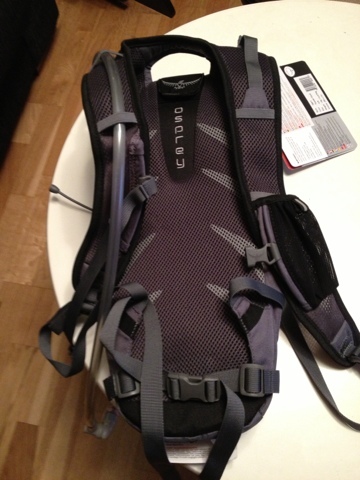 I managed to get another longer run in today and decided to test the Osprey Viper 4 hydration backpack. 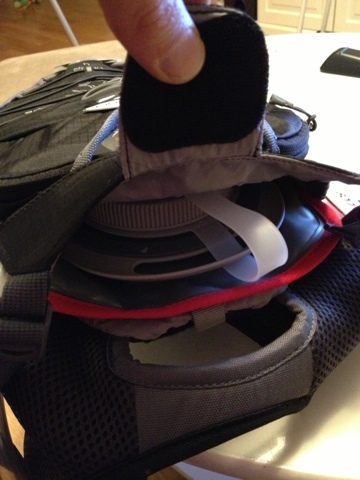 The backpack fits very well and sits firmly on the back and does not move around and interfere with the running. The only thing was that since I was not going very far today I did not fill it all the way and the water made quite a lot of "noise". 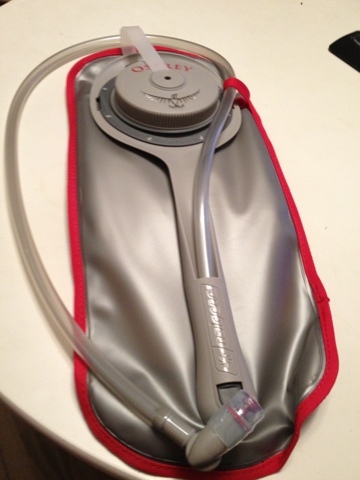 Using it for what it is supposed for was easy with the easy use mouthpiece and since it has a magnetic clip for the hose it is easy to access. Since I listened to an interview with Tim Noakes, MD about overhydration I was cautious, not that overhydration on a 13k run but more to not start any bad habits. The recommendation is to drink to your thirst, basically drink when you are thirsty and value if you need to drink or want to drink. I put Dr. Noakes book Waterlogged on my Amazon wishlist. One book that I did pull the trigger on was The Duel about the Boston Marathon in 1982. Will get back to you on that soon. Lately I have getting back into reading and last week I read a book on Search engine optimization and are looking to use my new knowledge in the near future. So today's run? I think I managed to put up a reverse split even if by a few seconds. I was a little surprised that I did hold up as well as I did and posted a 5,01 min/km for that long of a distance. I did run a 49:44 for the first 10km. So this was my second 13+ km in 3 days and made for a good finish of March which had a lousy start. I hope I can continue and carry it over to April. I'm hoping to sign up for a 18km race on April 20th. Here are the details of the run. Is not the issue. Formula is needed and/or wanted. Off to the kitchen to mix and start the feeding. Down the bottle contents go and we go back to the bedroom and down in the crib. No sleeping! Ok! In to our bed and some more formula and finally sleep is happening. 4:50 back in the crib sleeping, yay! 4:59 Hannah is awake. I go in to her room and try to get her to go back to sleep. Refill of her milk is needed and after gulping it down she is back to sleep. I grab Jack and we go to the couch to try to get some sleep and we actually get about 30 min before Norah is up again. Might as well go ut with Jack and bring Norah. 6:45 back from the walk and start making breakfast for Jack, Norah and myself. As I'm on my second cup of tea Hannah wakes up and wants breakfast as well. After breakfast the girls play and bring out tons of toys to the livingroom. 8:00 Norah is done and needs to go for her first nap of the day. Eventually I will need one to but now it's time to clean up the kitchen. Maybe Daylights Saving will do wonders for us? Thanks to the practice of half days in Sweden and the luxury I have of being able to work from home I got the chance of getting out for a long run in the afternoon yesterday. Since I was supposed to pick up Hannah from daycare I tried to time the finish to the pick up. This was the only requirement I had on the run, no certain pace, no certain distance, just get out and go. I tried to think about my form and not much else. This is why I don't use any music or such on the runs. I feel I get more out of the run this way by not being distracted or having something guiding my thoughts. The run started good, well they all do wen you live at the top of a hill. about 10 minutes in I realized that I had forgotten about lunch, not much to do but continue and see how it would affect the run. The roads and pavements are pretty dry now but I think there are many weeks yet before the pick up all the gravel thay put down on the ice over winter. When I passed 10 km after 52:09 I also look at my phone for the time and noticed I had to keep the current pace of just a little better to get back to daycare in time for the pickup from where I was and what route back I had decided on. Luckily this was not a problem on this day and I finished strong and pulled up at daycare just in time for the pick up after 15.92 km in 1:22 h.
Here are the deatails of the run. However I think the lack of sleep during the night and the missed lunch caught up to me because I felt tired and sluggish the rest of the day and evening. After a night's decent sleep I'm now looking forward to my next run, hopefully tomorrow. This weekend I'm signing me and Hannah up for Täbyloppet on May 26th. So I just wanted wrap this weeks posts up. I'm surprised myself that I got so many posts done this week, between work and sick family members. That I also got some training runs in was even more surprising. Let's see what next week brings. Vacation time in february this year meant getting on a plan that was suppsed to first find a very small island in the middle of a very large ocean and then land on a runway that practically starts on the beach. It looks like this on Youtube. Both those activities went fine and then a pillow fight broke out in our section of the plan and Hannah took one in the head. I guess that is some kind of French tradition. But lets back up a few hours. The plane had taken off from Paris Charles de Gaulle and to get on that plane we had taken an AirFrance flight from Stockholm 2 days earlier and booked a hotel at the airport. The plan was to go in to Paris and get a feel for the city and be living close to the flight Saturday morning. Paris in the rain is still Paris and it is definitely a city I would like to go back and visit again. We started out with taking the subway to the Notre Dame station. No surprise the Notre Dame cathedral was right there so we decided to go in and out of the rain. That cathedral is big, not St Peter big but big. After this we decided it was time for lunch and picked the place on the corner. As we would find on more places no high chairs and barely english spoken but good food. After lunch we took a walk along the Siene and got on a river tour boat that showed us most of the sights. Here are some photos from the boat. Back on land we walked over to the Louvre Museum and that is big! We decided that we had not enough time to go in and even browse a section and that it was not the best for the girls. We walked the streets of Paris and took in the atmosphere and a snack before getting on the subway back to the hotel and the airport. Next morning we had to separate as the taxis could not produce child seats. So I took the luggage in a taxi and Sarah took the girls on the train from terminal 2 to terminal 3. I have to say that were treated way better than what the reputation would have you believe in the airport. At security they showed us to the line where airline staff go through and one of the ladies at security took care of Norah while we did the security shuffle. Later at the gate familys with small children got to board with first class. So there it is, part one of our vacation. Today marked the first day that Norah came on a run with me and since she sleept most of the way she must have enjoyed it, right? Conditions were not to bad for a stoller-run, mostly clear sidewalks apart from all the gravel they put down over winter. Talking about winter, it is still here and for sometime as it looks in the weather reports. I guess we just have to deal with it, stay positive, keep running and hope spring is around the corner. When I got home Sarah and Hannah had decorated some cupcakes with frosting and sprinkles. So yummie that I forgot to get a picture of it. Here are the details for the 45:47 min 8,07 km run as recorded by my Garmin 305. 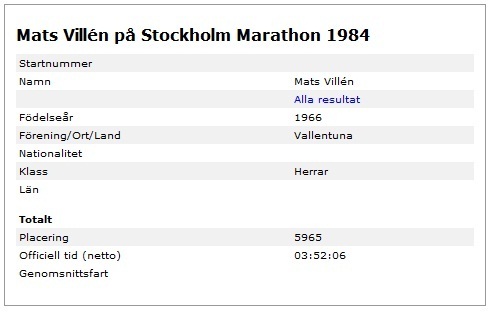 A couple of days ago I for some reason looked up my result from Stockholm Marathon 1984 and here it is. So it got me thinking that it might be interesting to see if I could beat that 3:52:06 30 years later. I would be disappointed if I did not since I now have decided more than a year ahead. However I do realize that many things can happen in terms of injuries and changes in the puzzle of life. I have a race plan for this year that I will post here in a couple of days. 3:52:06, that equals 5:30 min per kilometer and I hope that I can better that by at least 30 seconds, 42,2 kilometers is far so many things can happen along the race rout as well? With decent training I'm sure I can do it! Well there is my goal when I go out for my runs the next 14 months. Just about to take these puppies out for a test run. They feel grat on the foot so let's go. Ok, so I'm back from the run, which can be found here . I decided to get out on the ice for a while and run. The Merrell's were fantastic, light, nice toe-box and the shape of the sole really promotes the midfoot striking. The feel is clearly different, based on one run, than my Innov8 F195's that I also really like. I think I will run many kilometers in these shoes. The actual run was good based on the fact that I have not run anything in over a month. One thing that I did think about was to really think about my form. Overall I'm happy and feel ready to continue my comeback. 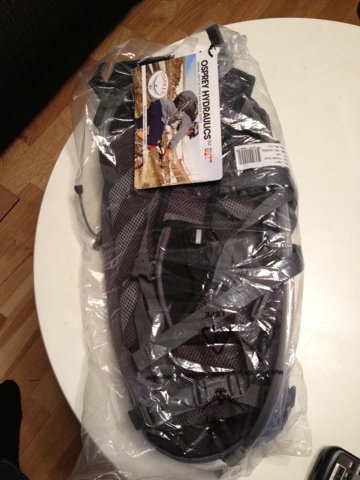 So my new backpack is here and I can't wait to try it out but with the weather we are experiancing I might be better of fill the hydration pouch with hot chocolate. Well first it needs to be unpacked and checked out. 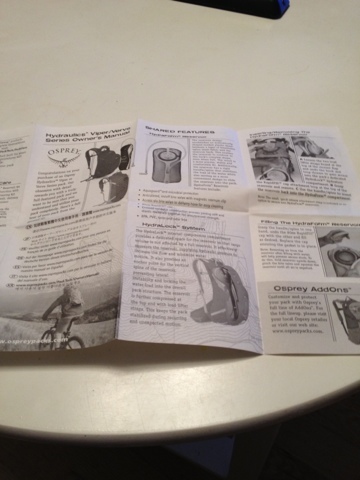 Here are some pictures from the unpacking. I'll report back after trying it out.